Barcelona was held to a one all draw by Real Madrid at home, and the team from Spanish Capital starts on the front foot in the 2nd Leg. This result didn't come to me as much of a surprise. I warned about this in my earlier article - Why Barcelona should be vary of the Real Madrid threat?. Sometimes, you get a different kind of vibe from the events and enrgy surrounding a match, and this match I felt the same. That's the reason why I came up with that earlier article, just to warn about the folly of taking Real Madrid lightly. Did we pay dearly for the mistake of taking an opponent lightly? Only we will come to know after the second leg. But it's safe to say now that Barcelona in a third time in a row is starting on the back foot going into the Copa second leg. We turned it around against Levante and Sevilla, will we be able to do it at the Santiago Bernabeu? Some would argue that a 1-1 draw is not such a bad result. Maybe they have a point, especially looking at how we have fared in our recent visits to Santiago Bernabeu. But even then a 2nd leg tie of a Cup match is a different story, one you definitely have to win or not lose after scoring at least twice. The match is tricky for both the sides, no one can relax, but Real Madrid will be buoyed by this result; there is no denial of that. In my previous article, I have clearly warned how complacency could make the life miserable for us. Unfortunately, I was proven right. The most frustrating part of the match was the realization that this Madrid side despite their fighting spirits is not that great and should not have walked away with a draw. They were by far the better team in the first half, but that was due to the fact they remained better organized and most of the chances were conceded by our midfielder giving away balls at the crucial position. Our players, many went with an attitude that they just have to turn up for securing their victory. They were taking unnecessary risks and that explained the number of times we gave away the ball in crucial positions. Real Madrid to their credit remained organized and that created the sense that they were much better while going forward. They were definitely better in the first half and we were damn lucky not to have seen the deficit increase. In the first half, only two players actually stood up for Barca - Nelson Semedo and Malcom. These two were spearheading everything and the way Malcom got Marcelo pinned back was really brilliant. It was no surprise to see that these two were involved in everything Barca did. They were really good in offense and equally good in defense. Unfortunately, none of their teammates raised their game in the first half. If a couple of more have supported them, we would have a completely different result. Towards the end of the first half, Barcelona started to settle and one of the reason was players raising their game. That continued after the break also. Most of the time in the second half, we pinned Real Madrid back and that showed very clearly that when this team plays to their potential, this Madrid side is no threat. 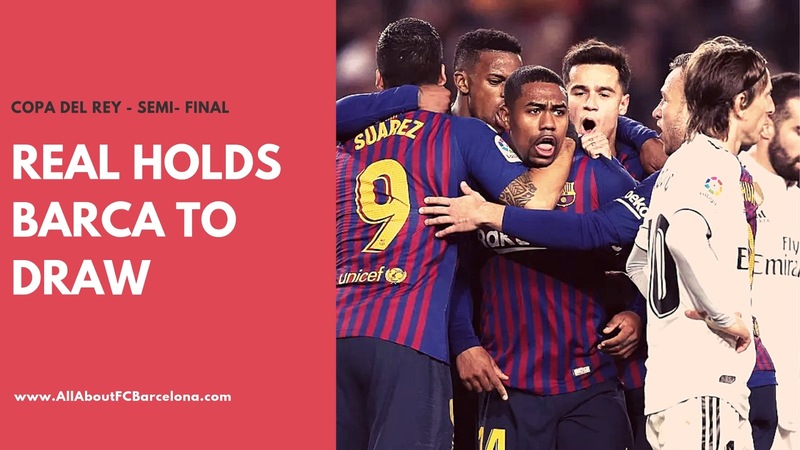 In the 57th minute Malcom grabbed a deserving equalizer and everyone will agree that it was coming. Messi came in for a below-par Coutinho immediately but wasn't at his very best. Real remained organized despite the constant Barca attack and in the end, a 1-1draw was a deserved result.